Lily-Arison Rene de Roland was the first Malagasy student to begin his DEA (Master’s of Science equivalent degree) with the Peregrine Fund. He began his academic study in 1992 on “Raptor surveys on the Masoala Peninsula of northeastern Madagascar”. He obtained his DEA degree in 1994 from the University of Antananarivo in Ecological Environment, and in 2000 doctorate (PhD) in Ecological Environment at the same university with his dissertation on “Ecology of three Accipiter species on Masoala Peninsula of northeastern Madagascar”. He defended his post-doctorate in 2010 on “Raptors and birds as conservation tools in Madagascar”. Lily has presented papers at the 9th, 10th and 12th Pan-African Ornithological Congresses in Ghana, Uganda and South Africa, respectively. In 1998 he presented a paper at the Vth Conference of the World Working Group on Birds of Prey and Owls in South Africa. In 1998, he participated in a study on the impact of forest fragmentation in the Usambara Mountain, Tanzania for Earthwatch International. 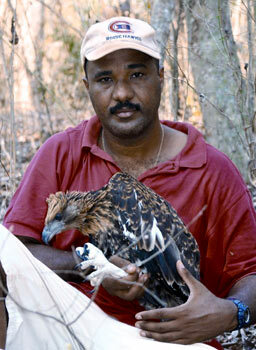 From 1996 to 2003, he conducted bird inventories for Madagascar National Parks for The Peregrine Fund. In 2005, he became National Director for The Peregrine Fund’s Madagascar Project. In 2006, he participated in a training session on bird flu surveillance at Burkina Faso, and later that year he rediscovered the Madagascar Pochard (Aythya innotata) in northwestern Madagascar. In 2008, he attended a migratory raptor meeting at Abu Dhabi, United Arab Emirates. In 2010, he was honored as one of six Disney Conservation Heroes. Lily is interested on biological and ecological study of birds, corridor study and working with local communities for habitat management and conservation. Lily has authored or co-authored over 20 publications on Malagasy fauna.